But no worries. Here's how to clean your diamond ring the Right Way. Before you bring your Diamond Ring in for an Appraisal, you've got to make it look its best. You wouldn't go to a job interview without showering would you? (We hope not). So don't let Your Diamonds go to their appraisal without a shower of their own. Clear and shiny diamonds are what will get you those higher profits. Not dusty, rusty stones. A clean ring not only looks more impressive, but is more impressive. You want the jewelry appraiser to truly see your diamond ring for what it is and what it's worth. A good scrubbing will go a long way, letting you show off every wonderous aspect of your ring: the meticulously cut diamond, the ornately designed prongs, and the carefully crafted setting. Becuase every diamond is meant to shine. Basically, a clean ring is just a whole lot prettier and a whole lot easier to deal with. Not to mention, a clean ring shows the buyer that YOU CARE. A jewelry buyer is less likely to scam or cheat you into selling for less than the ring's true value, if they know the diamond means something to you. A clean ring shows jewelers that you cherish this ring and you are not going to let them get the best of you in a trade. You Deserve to Sell your Diamond Ring for its Full Worth. So, take the time to polish and clean all the grime off your ring, and let that diamond sparkle. Work that diamond. Note: Before choosing the right method for you, it's best to determine what kinds of dirt are on your diamond ring. If it's simply a matter of general wear, then any of the below methods should do the trick. However, if the dirt is a result of more damaging materials such as manure from your Sunday gardening or leftover sand from a day at the beach, then using one of the heavier duty methods will work best. For this kind of dirt, you'll want to stick to either a high-quality cleaning solution, an ultrasonic cleaning machine, or consider taking your diamond ring to be cleaned by professionals. Put some dishwasher soap into a bowl of warm to hot water. The ratios for this don't matter. Place your ring into the bowl and let it soak for 15 to 40 minutes (depending on how much dirt there is). This will loosen up any dirt and grime particles sticking to your ring. Next, use a brush and stroke the diamond upward. You’ll want to use a soft bristle brush so you don’t scratch the setting or prongs. For this, you can use either a baby tooth brush, an old adult toothbrush, a soft paint brush, or a mascara brush. Whichever you use, make sure to clean the brush thoroughly before using it on the diamond. No use in smearing more dirt. Be sure to get underneath the diamond as well. 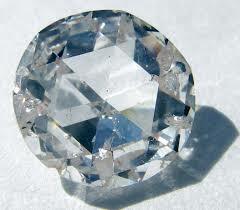 Most dirt builds up on the underbelly of diamond rings from natural oil, lotions, creams etc . If you still see grime on the diamond, you can repeat this process until you are happy with the shine. When you are finished, place the ring on a soft tissue and allow it to air dry so as not to make any smudges. 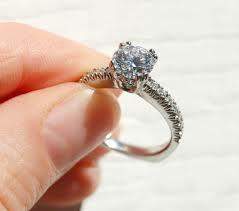 If you have ammonia in your house, you can use an ammonia and water solution to get your ring nice and shiny. In a small bowl, combine one part ammonia and 3-4 parts warm water. Place the ring inside the bowl and allow the ring to soak for about 20 minutes. As with the previous method, use a soft bristle brush to gently scrub the diamond. Rinse the ring in clean water and set aside to air dry. You can also use a hair dryer to dry off the ring if you are in a hurry. Just don’t rub or else you might end up with smudges. 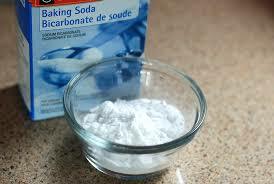 Pour baking soda into a small bowl and add water. The goal is to create a thick paste to clean the ring with. You don’t need a brush for this method, just use your finger to rub the paste all over the diamond. Make sure to fully cover the ring, getting the paste on the top, sides, and underside of the diamond. When you are done, place the ring in a cup of clean, warm water to wash off. Shake off excess water and place your ring on a soft tissue to airdry. If you are in a rush, you can use a lint-free cloth to polish and dry off your ring. In a small bowl, create a solution of ½ cup vinegar and 2 Tbsp. baking soda. Carefully place your diamond ring into the solution, and allow to soak for about 15 minutes. Be sure the ring is fully immersed in the solutions so all parts are cleaned. Use a soft bristle brush to clean off any residual dirt. Rinse off in clean cold water, and dry off immediately with a lint-free cloth. 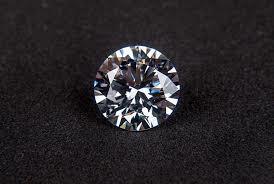 Quality diamond cleaning solutions are pretty easy to find now a days. This method can be a good choice if you are in a hurry, as these commerical solutions are usually designed to be a quick cleaning alternative. Pour a small amount of ring cleaner into a bowl. You only need to pour enough so that the liquid fully covers the ring. Gently place the ring inside the bowl and let it sit for the recommended amount of time. Do not let your diamond soak for longer than the product details instruct. Diamond ring cleaning solutions are generally made of harsher ingredients than the all-natural solutions, so it is not a good idea to expose the ring to those ingredients for too long. Remove ring and gently pat with a lint free cloth to remove excess liquid. Ultrasonic cleaners are heavy duty. If you find that your ring is covered in thick grime, and the other methods just aren’t doing the job, an ultrasonic cleaner may be your answer. Ultrasonic cleaners work by creating ultrasonic vibrations when the motor is turned on. These vibrations essentially shake and break apart any dirt particles sticking to your ring. If you plan on cleaning your ring often, you may want to just invest in an ultrasonic cleaner to have at your own disposal. You can get a good/basic cleaner from Amazon starting at around $40. However, if this is a onetime cleaning, it might be more worth it for you to take your ring to a jeweler to get it professionally cleaned. Many professional jewelers and jewelry stores own ultrasonic cleaners, and if you bring your ring to the place you bought it from, they likely won’t even charge you for the service. First, decide what solution you want to use. You can either buy a special diamond cleaning solution to place into the machine, or you can create your own. 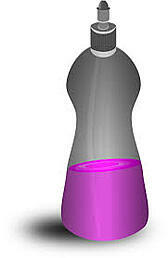 To make your own solution just add water, ammonia, and dishwasher soap. 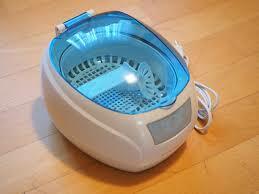 Make sure the water is hot, unless your ultrasonic cleaner has a built-in heater to heat the water itself. Next, read the directions thoroughly! No use in breaking your machine or damaging your ring, so read slowly and carefully. The instructions are usually not long or complicated, but you want to be sure you are using the machine correctly. Simply place your ring inside, and let the machine run for however long is needed until your ring is perfectly clean. Turn off the machine, and let your diamond ring sit for about 5 minutes. This allows any dirt particles floating in the water to sink to the bottom of the casket. Take your ring out and let it airdry, or use a lint free cloth if you are in a rush. Cleaning your diamond ring will give it that special shine it's meant to have. However, properly caring for your ring on a general, everyday basis is what will really keep your diamonds sparkling. Whether it is for your own enjoyment or for selling purposes, caring for your ring properly can make all the difference. First things first- you don’t need to wear your ring all the time. If you are going to be scrubbing the floors or potting new plants, chances are no one’s going to be noticing your ring and you don’t need to be wearing it. Take it off and be sure to put it someplace you will remember, someplace safe and secure. If you don’t want to take off your ring for sentimental reasons, then you can just wear a pair of heavy duty gloves while working. Secondly, make sure to inspect your diamond ring regularly. 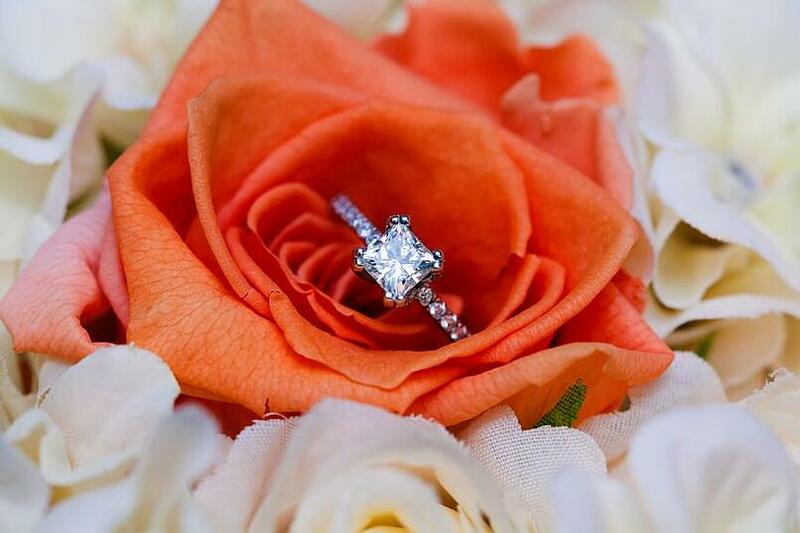 Look over the diamonds, the setting, and the prongs. This way, if there are any cracks or scratches beginning, you will notice right away and can get your ring fixed before the damage gets worse. Lastly, be sure to store your ring carefully and pay attention to how you place it. Keep your ring separate from other precious metals and jewelry pieces, so they don't rub, scratch, or cut one another. Even just a small bumpt can smudge the metal. Consider storing the diamond ring in a separate jewelry case. Or, wrap it with soft tissue and/or cloth. Ready for that Free Appraisal? Come in to Luriya Today! >> Arm Cuffs: Yay or Nay?